Syria affirmed that the US-led coalition’s warplanes have launched tens of raids on the Syrian economic facilities instead of raiding the Islamic State (ISIS) organization and its tanks that transport the stolen Syrian oil into Turkey. “The US-led coalition’s shelling of the economic facilities and infrastructure, and the unilateral coercive measures adopted by some countries on the Syrian people are the reason behind the mounting difficult conditions Syria is passing through,” Foreign and Expatriates Ministry said in two identical letters sent Wednesday to the UN Secretary General and President of Security Council. 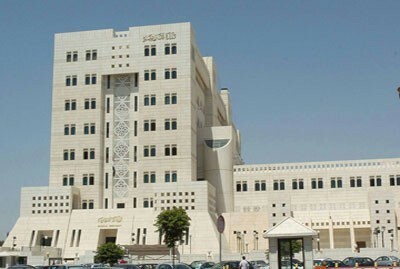 It added that in light of this deliberate destruction of the oil and economic establishments, the Syrian Arab Republic reserves its right in demanding the US-led coalition’s countries to pay compensations to Syria in return for this destruction as it is a right guaranteed by the international law. On December 8th and 13th, the international coalition shelled a number of oil and gas stations in Deir Ezzor under the pretext of hunting the ISIS, causing losses estimated at hundreds of millions USD. “The US-led coalition has launched scores of raids on the Syrian economic installations instead of bombarding the ISIS tanks which transport the stolen Syrian petroleum and it didn’t present any information about the shelling to the UN according to the UN charter,” the two letters reiterated. The letters added “In this regard, the armed terrorist organizations don’t loot the Syrian oil directly from the stations, but they steal the oil from places neighboring the oil wells which spread in the Syrian oil fields, then they sell the petroleum through Turkish channels.